Abstract: Gaucher disease (GD) is a heritable storage disorder caused by functional defects of the lysosomal acid β-glucosidase and the accumulation of glucosylceramide within macrophages, resulting in multiple organ dysfunction. There are three commercially available enzyme replacement therapy (ERT) products for the treatment of GD type 1 (GD1): imiglucerase, velaglucerase alfa, and taliglucerase alfa. Imiglucerase and velaglucerase alfa are produced in different mammalian cell systems; imiglucerase requires postproduction deglycosylation to expose terminal α-mannose residues, which are required for mannose receptor-mediated uptake by target macrophages. These steps are critical to the success of ERT for the treatment of visceral and hematologic manifestations of GD. Taliglucerase alfa is the first US Food and Drug Administration-approved plant-cell-expressed recombinant human protein, using carrot root cell cultures. Furthermore, it does not require postproduction glycosidic modifications. It is indicated for treatment of adults with GD1 in the US, Israel, Australia, Canada, Chile, Brazil, and other countries, and it is additionally approved for the treatment of pediatric patients in the US, Australia, and Canada and for the treatment of hematologic manifestations in pediatric patients with Type 3 GD in Canada and other countries. Our review focuses on the role of taliglucerase alfa in the pediatric population. A literature search through PubMed (from 1995 up till November 2016) of English language articles was performed with the following terms: Gaucher disease, lysosomal storage disease, taliglucerase. Secondary and tertiary references were obtained by reviewing related articles as well as the website www.Clinicaltrials.gov. It has been demonstrated that taliglucerase alfa is efficacious, with a well-established safety profile in pediatric, ERT-naïve patients with symptomatic GD1, as well as for those patients previously treated with imiglucerase. GD is classified into GD type 1 (non-neuronopathic), GD type 2 (acute neuronopathic), and GD type 3 (chronic neuronopathic) according to the presence of neurological deterioration, age at identification, and rate of disease progression.4,5 Many patients with GD type 1 have signs or symptoms during childhood, which include anemia, thrombocytopenia, hepatosplenomegaly, bone disease, pubertal delay, and growth retardation.6,7 Earlier onset correlates with more severe disease and a high risk of morbidity. Splenomegaly, hepatomegaly, and bone disease are each found in more than 80% of children at diagnosis. Anemia and moderate-to-severe thrombocytopenia, both found in approximately 40% of children, are caused by bone marrow infiltration and hypersplenism.6 Growth and puberty are significantly delayed in ~60% of adolescents with untreated GD and is a significant disease burden,7 which can have a considerable psychological impact. Abbreviations: ERT, enzyme replacement therapy; GD, Gaucher disease; NA, not applicable. The studies were carried out in a number of medical centers worldwide and were designed to assess the safety and efficacy of taliglucerase alfa in both adult and pediatric patients who were ERT-naive or ERT-experienced and switched from imiglucerase to taliglucerase alfa.3,18–24 Treatment was generally well tolerated, and all drug-related adverse events (AEs) were mild/moderate and transient. The objective of this review is to discuss the published data on pediatric population from these studies. The safety and efficacy of taliglucerase alfa have been examined in Studies PB-06-002 in patients previously treated with imiglucerase through 9 months, PB-06-005 in treatment-naive pediatric patients through 12 months, and in extension study PB-06-006 for an additional 24 months, for a maximum duration of 33–36 total months of treatment (Figure 1). Figure 1 PB-06-002 was a switchover study from imiglucerase to taliglucerase alfa. 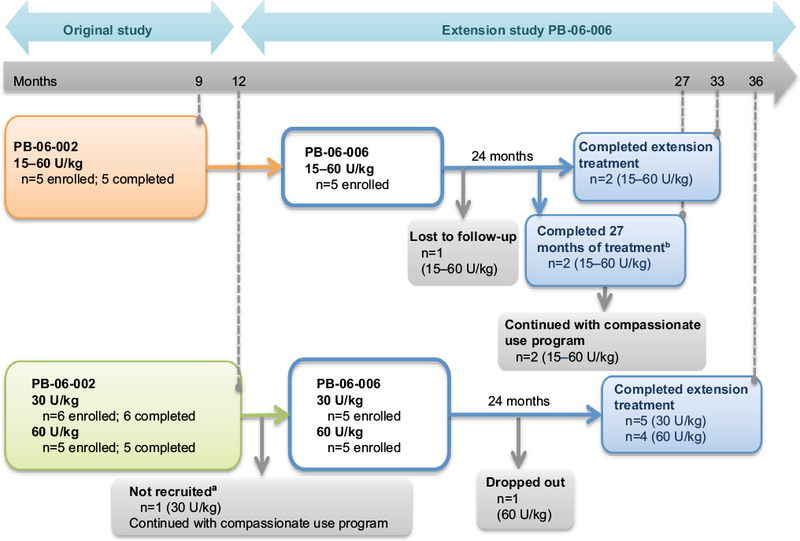 PB-06-005 was a phase 3B multicenter, randomized, double-blind, 2-dose trial of taliglucerase alfa (30 and 60 U/kg per infusion every other week) in pediatric patients (aged 2 to <18 years) through 12 months (US National Institutes of Health www.clinicaltrials.gov identifier NCT01132690). Male and female patients aged 2 to <18 years were required to have a diagnosis of GD with leukocyte acid β-glucosidase activity level ≤30% of the mean activity of the reference range for healthy individuals. Patients were eligible if they were determined in need of treatment with ERT based on clinical condition and the opinion of the local investigator and had neither received ERT in the past or within the previous 12 months and had a negative anti-glucosidase antibody assay assessment, nor been treated with substrate reduction therapy for GD in the past 12 months. The trial was conducted at 3 centers from August 2010 until May 2012. Eleven patients were randomized to receive taliglucerase alfa 30 U/kg or 60 U/kg per infusion every other week for 12 months and all 11 completed the study.3 PB-06-002 was a Phase 3, multicenter, open-label, switchover trial (US National Institutes of Health www.clinicaltrials.gov identifier NCT00712348) designed to assess the safety and efficacy of the switch to treatment with taliglucerase alfa in adults and pediatric patients through 9 months. Eligible patients included males and females (≥2 years of age) with a diagnosis of stable GD and leukocyte glucocerebrosidase (β-glucosidase) activity level ≤3 nmol/mL/h (≤30% of the mean activity of the reference range). no evidence of worsening spleen or liver enlargement as detected by palpation, ultrasound, or magnetic resonance imaging (MRI) over the last year while being treated with ERT. The stability definition was amended to allow the use of 6 historical hemoglobin concentration values and platelet counts for patients affected by the 2009 global imiglucerase shortage.23 Patients were required to have received imiglucerase therapy for at least the last 2 years and were currently on a stable maintenance regimen (ie, dose had not been changed except for a situation that arose because of the drug shortage) for at least the last 6 months prior to enrollment. The study was conducted at 11 medical centers worldwide from December 2008 until January 2013. In the PB-06-005 (‘naive-pediatric’) and PB-06-006 (‘extension’) studies, the primary end point was the median percent change in hemoglobin concentration from baseline and the interquartile range of median percent change in hemoglobin levels from baseline. Secondary end points included the percent changes from baseline in spleen volume, liver volume, platelet counts, and either chitotriosidase or CCL18 activity. In the switchover study, the change in mean hemoglobin after a total of 33 months of treatment was from 13.5 to 14.5 g/dL, corresponding to a 3.3% increase. In the treatment- naive group, the change in mean hemoglobin was from 11.2 to 13.2 and 10.6 to 12.7 g/dL in the 30 and 60 U/kg dose arms, respectively, after completing a total of 36 months on taliglucerase alfa.25 These changes correspond to an increase in hemoglobin concentration of 19.7% and 23.3%, respectively. In the switchover study, the change in mean platelet count after a total of 33 months of treatment was from 164,587 to 210,000/mm3, corresponding to a 2.3% increase. In the treatment- naive arm, the change in mean platelet count was from 182,000 to 220,200/mm3 and from 99,600 to 243,750/mm3 in the 30 and 60 U/kg dose arms, respectively, after completing a total of 36 months on taliglucerase alfa.25 These changes correspond to an increase in platelet count of 23.9% and 156.6%, respectively. In the switchover study, the change in mean spleen volume after a total of 33 months of treatment was from 4.1 to 1.7 multiples of normal (MN), corresponding to a 5.3% decrease. In the treatment- naive arm, the change in mean spleen volume was from 23.9 to 9.0 MN and from 29.4 to 6.6 MN in the 30 and 60 U/kg dose arms, respectively, after completing a total of 36 months on taliglucerase alfa.25 These changes correspond to a decrease in spleen volume of 67.8% and 68.9%, respectively. In the switchover study, the change in mean liver volume after a total of 33 months of treatment was from 1.3 to 0.9 MN, corresponding to an 8.8% decrease. In the treatment- naive arm, the change in mean liver volume was from 1.9 to 1.3 MN and from 2.2 to 1.5 MN in the 30 and 60 U/kg dose arms, respectively, after completing a total of 36 months on taliglucerase alfa.25 These changes correspond to a decrease in liver volume of 37% and 34.3%, respectively. In the switchover study, the change in chitotriosidase activity after a total of 33 months of treatment was from 10,432 to 370.5 nmol/mL/h, corresponding to a 97.1% decrease. In the treatment- naive arm, the change in mean biomarker activity was from 30,783 to 7,640.6 nmol/mL/h and from 34,968 to 5,204.0 nmol/mL/h in the 30 and 60 U/kg dose arms, respectively, after completing a total of 36 months on taliglucerase alfa.25 These changes correspond to a decrease in chitotriosidase activity of 72.2% and 84.4%, respectively. After completion of 12 months of treatment with either 30 U/kg or 60 U/kg of taliglucerase alfa in the naive-pediatric trial, increases in height and weight were seen in both dose groups. Mean growth velocity was estimated to be 5.1 and 8.0 cm/yr in the 30 and 60 U/kg treatment arms, respectively.3 All growth parameters were physiological and increased proportionally with age. Taliglucerase alfa infusions were shown to have a positive safety profile in children and adolescents throughout the studies. The safety results in the pediatric population reflect those seen in the pivotal phase 3 trial in adults, as well as in the extension study, although vomiting was reported more often in the pediatric population.3,21–25 No new safety concerns were identified in the pediatric subgroup. No SAE were deemed related to taliglucerase alfa, and no patients withdrew from the study because of an AE. Taliglucerase alfa treatment had a positive effect on key efficacy parameters in children with GD, which included improvement in growth, hematological, and visceral manifestations. Treatment was well tolerated, and no unexpected safety concerns were identified. The production process of the plant-cell-expressed enzyme introduces benefits such as the inability to be contaminated with or propagate mammalian pathogens, along with a potentially lower manufacturing cost. The cost to benefit ratio and greater safety may help address rising concerns regarding health care expenditure for orphan diseases. Increased clinical experience will demonstrate the extent to which taliglucerase alfa is incorporated in the therapeutic armamentarium for GD. None of the authors received compensation for their contributions to this manuscript. Editorial support was provided by Julie Collins, CMPP, Peloton Advantage. Drs Gupta and Pastores contributed to the writing of the manuscript and approved the final manuscript. All authors contributed toward data analysis, drafting and critically revising the paper and agree to be accountable for all aspects of the work. The authors did not receive financial support for the preparation of the manuscript. Pfizer provided a courtesy medical accuracy review and offered to pay the very minor permission fee for obtaining copyrighted information for the table and figure on the authors’ behalf. The authors report no other conflicts of interest in this work. Grabowski GA, Petsko GA, Kolodny EH. Gaucher disease. In: Scriver CR, Beudet AL, Sly WS, editors. The Metabolic and Molecular Basis of Inherited Disease. New York, NY: McGraw-Hill; 2010:1–143. Meikle PJ, Hopwood JJ, Clague AE, Carey WF. Prevalence of lysosomal storage disorders. JAMA. 1999;281:249–254. Zimran A, Gonzalez-Rodriguez DE, Abrahamov A, et al. Safety and efficacy of two dose levels of taliglucerase alfa in pediatric patients with Gaucher disease. Blood Cells Mol Dis. 2015; 54(1):9–16. Zimran A, Elstein D. Lipid storage diseases. In: Lichtman MA, Kipps T, Seligsohn U, Kaushansky K, Prchal JT, editors. Williams Hematolog. 8th ed. New York, NY: McGraw-Hill; 2010:1065–1071. Mistry P, Germain DP. Phenotype variations in Gaucher disease. Rev Med Interne. 2006;27:S3–S10. Andersson H, Kaplan P, Kacena K, Yee J. Eight-year clinical outcomes of long-term enzyme replacement therapy for 884 children with Gaucher disease type 1. Pediatrics. 2008;122:1182–1190. Kauli R, Zaizov R, Lazar L, et al. Delayed growth and puberty in patients with Gaucher disease type 1: natural history and effect of splenectomy and/or enzyme replacement therapy. Isr Med Assoc J. 2000;158–163. Charrow J, Andersson HC, Kaplan P, et al. The Gaucher registry: demographics and disease characteristics of 1698 patients with Gaucher disease. Arch Intern Med. 2000;160:2835–2843. Charrow J, Andersson HC, Kaplan P, et al. Enzyme replacement therapy and monitoring for children with type 1 Gaucher disease: con- sensus recommendations. J Pediatr. 2004;144:112–120. Barton NW, Brady RO, Dambrosia JM, et al. Replacement therapy for inherited enzyme deficiency—macrophage-targeted glucocerebrosidase for Gaucher’s disease. N Engl J Med. 1991;324:1464–1470. Cerezyme [package insert]. Cambridge, MA: Genzyme Corporation; 2009. VPRIV [package insert]. Lexington, MA: Shire Human Genetic Therapies, Inc.; 2013. Elelyso [package insert]. New York, NY: Pfizer Labs; 2014. Shaaltiel Y, Bartfeld D, Hashmueli S, et al. Production of gluco- cerebrosidase with terminal mannose glycans for enzyme replacement therapy of Gaucher’s disease using a plant cell system. Plant Biotechnol J. 2007;5:579–590. Fox JL. First plant-made biologic approved. Nat Biotechnol. 2012; 30:472. Opar A. ‘Pharmers’ hope for first plant drug harvest. Nat Rev Drug Discov. 2011;10: 81–82. Aviezer D, Brill-Almon E, Shaaltiel Y, et al. A plant-derived recombinant human glucocerebrosidase enzyme—a preclinical and phase I investigation. PLoS One. 2009;4: e4792. Grabowski GA, Golembo M, Shaaltiel Y. Taliglucerase alfa: an enzyme replacement therapy using pla nt cell expression technology. Mol Genet Metab. 2014;112:1–8. ClinicalTrials.gov, National Institutes of Health. Plant cell expressed recombinant human glucocerebrosidase extension trial. NLM identifier: NCT00705939. ClinicalTrials.gov, National Institutes of Health. Expanded access trial of plant expressed recombinant glucocerebrosidase (prGCD) in patients with Gaucher disease. NLM identifier: NCT00962260. Zimran A, Brill-Almon E, Chertkoff R, et al. Pivotal trial with plant cell-expressed recombinant glucocerebrosidase, taliglucerase alfa, a novel enzyme replacement therapy for Gaucher disease. Blood. 2011;118:5767–5773. Zimran A, Gonzalez-Rodriguez DE, Abrahamov A, et al. Long-term safety and efficacy of taliglucerase alfa in pediatric patients with Gaucher disease who were treatment-naïve previously treated with immiglucerase. Abstract 293. Mol Genet Metab. 2015;114(2): S129. Pastores GM, Petakov M, Giraldo P, et al. 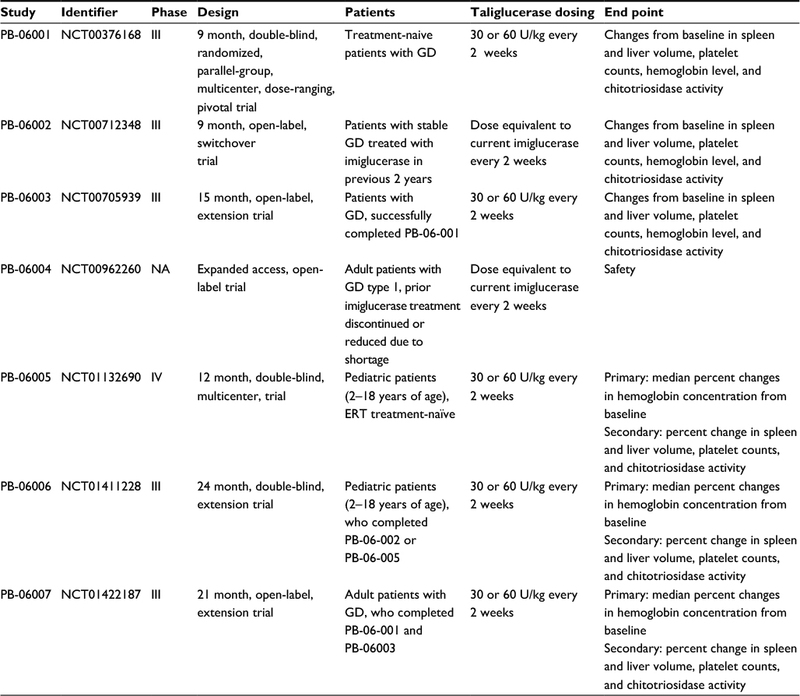 A Phase 3, multicenter, open-label, switchover trial to assess the safety and efficacy of taliglucerase alfa, a plant cell-expressed recombinant human glucocerebrosidase, in adult and pediatric patients with Gaucher disease previously treated with imiglucerase. Blood Cells Mol Dis. 2014;53(4):253–260. ClinicalTrials.gov, National Institutes of Health. A multicenter extension study of taliglucerase alfa in adult subjects with Gaucher disease. NLM identifier: NCT01422187. Zimran A, Gonzalez-Rodriguez DE, Abrahamov A, et al. Long-term safety and efficacy of taliglucerase alfa in pediatric Gaucher disease patients who were treatment-naïve or previously treated with imiglucerase. Blood Cells Mol Dis. 2016;S1079-9796(16):30221–30222. ClinicalTrials.gov, National Institutes of Health. A multicenter extension study of taliglucerase alfa in pediatric subjects with Gaucher disease. NLM identifier: NCT01411228. Hughes DA, Gonzalez DE, Lukina EA, et al. Velaglucerase alfa (VPRIV) enzyme replacement therapy in patients with Gaucher disease: long-term data from phase III clinical trials. Am J Hematol. 2015;90(7):584–591.